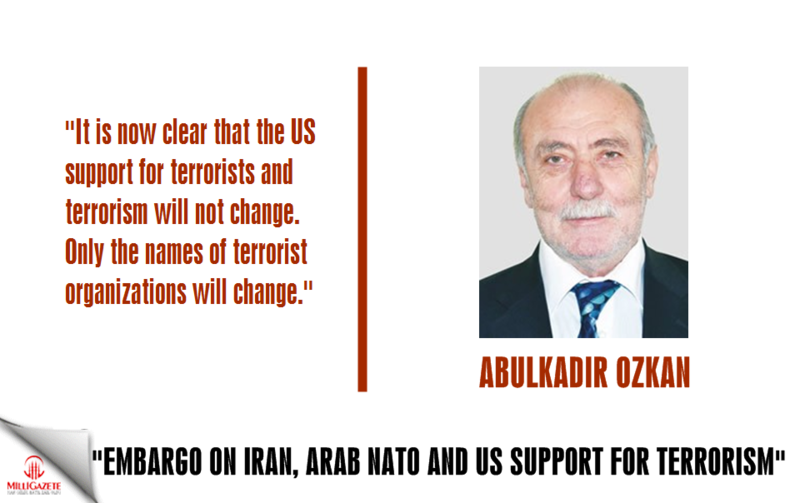 Abdulkadir Ozkan: "embargo On Iran, Arab Nato And Us Support For Terrorism"
›Abdulkadir Ozkan: "Embargo on Iran, Arab NATO and US support for terrorism"
Milli Gazete columnist Abdulkadir Özkan writes about US policy in last period and Iran Embargo. Here is the full article. It is now clear that the US support for terrorists and terrorism will not change. Only the names of terrorist organizations will change. In short, the United States wants to give the region the way they want to deal with terrorist organizations using tongs. In this regard, Turkey's priority now should not be talked about with adjectives such as friends or allies of the United States. In particular, it would not be a realistic approach to wait for the terrorist organizations to cut off their support. Following the announcement that two days before the announcement of awarding the so-called three leaders of the PKK terrorist organization, the Presidency Spokesman Kalın said, Support to the PYD and support for PKK terrorism is a statement by Jeffrey, the US Special Envoy for Syria. No matter how you think, our view will not change. Isn't Jeffrey mis contradiction to the support of the PKK ranks the support given to the YPG? question, the position of the PKK is clear. Unlike the PKK, we do not recognize YPG as a terrorist organization. We've never done that orum I don't even think it needs to be explained. This evaluation shows that the US will not abandon terrorism. "We understand Turkey's security concerns. He has concerns about the links between the YPG and the PKK. That's why we're being careful. First, we inform you what we do and why we do it. Apparently, they knew they'd be surprised to know Despite Turkey's security concerns, they wonder. What, why to give information about Turkey Could this means it does not disappear acknowledgment of Turkey's concerns? Moreover, Turkey is not content to just bring voice their safety concerns, ypg's persistently emphasizes that the Syrian branch of the PKK and all kinds of information with the United States that Turkey has in this regard. Despite towards Turkey, "You judge it as a terrorist organization, but we're not in that opinion YPG, You could be one explanation for the seriousness of saying? Moreover, considering the embargo imposed on Iran by the US, which turns our region into a marshland of terror, it would not be wrong to say that we are not only trying to design our region with terrorist organizations, but also trying to fire a conflict between states in our region. For example, there may not be such a danger for the embargo on Iran, but what will the Arab NATO, which is claimed to be formed for Iran, do in the region? What will the country act on? Moreover, what does the Arab NATO, which is said to be formed against Iran, do? If it will be used as a training weapon against Iran, will it not mean that our region is dragged into complete chaos? Not all these developments are enough to show that the US is taking steps to fuel tension, not to contribute to the solution of problems in our region. Moreover, the Kurdish region created after the occupation of Iraq is not enough in this country, as the US formed bases in tens of thousands of soldiers stated, since the beginning of the conflicts in Syria, known to have established more than ten bases will do what these bases? Will it not be used or used for the training and arming of terrorist organizations even if it is not directly involved in conflicts? As a result, our region and especially our country is under threat from the USA. In this respect, we have to create full unity within ourselves. With a number of voting accounts, the society needs to be discouraged from using a parser style.